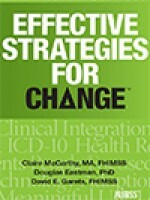 Effective Strategies for CHANGE is a newly revised edition of HIMSS’ best seller Change Management Strategies for an Effective EMR Implementation. Published in 2009, Change Management Strategies prepared readers to lead or participate successfully in change management/technology adoption efforts to achieve meaningful use of EMRs. The authors provided successful strategies to plan and implement change—based on their decades of combined experience managing the people side of implementation. This revised edition explores how healthcare has changed since the first edition was published. It equips readers with the tools to create an environment for success in their organizations that not only ensures EMR, ICD-10 or clinical integration efforts are successful, but that organizations can build change capacity and flexibility in the process.